E3 SUMO-protein ligase EGR2 belongs to the EGR C2H2-type zinc-finger protein family. EGR2 is a sequence-specific DNA-binding transcription factor and binds to two specific DNA sites located in the promoter region of HOXA4. EGR2 helps SUMO1 conjugation to its coregulators NAB1 and NAB2, whose sumoylation down-regulates EGR2 own transcriptional activity. Defects in EGR2 are a cause of congenital hypomyelination neuropathy (CHN), of Charcot-Marie-Tooth disease type 1D (CMT1D), and of Dejerine-Sottas syndrome (DSS). Rabbit polyclonal antibodies were produced by immunizing animals with a GST-fusion protein containing the C-terminal region of human EGR2. Antibodies were purified by affinity purification using immunogen. Fig 1. 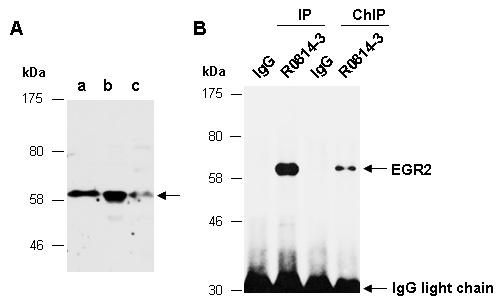 (A) Western blot of total cell extracts from a. mouse brain, b. mouse thymus, c. human HeLa; using anti-EGR2 (C) (R0814-3) at RT for 2 h. (B) Total extracts from mouse thymus were immunoprecipitated (IP) with IgG or anti-EGR2 (C) (R0814-3) under the conventional IP conditions or cross-linked chromatin immunoprecipitation (ChIP) conditions; followed by WB with the same Ab and Rabbit IgG light chain-specific 2nd antibody.